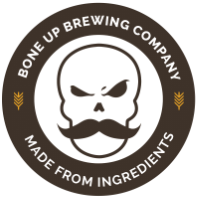 Stats: Bone Smasher - Bone Up Brewing Co.
Color: Tawny, with hints of fulvous burnt umber. Music Pairing (Jimbo's Choice): "It's Time to Party" by Andrew W.K. Music Pairing (Jared's Choice): "Romance Dawn" by Radkey. Best Occasion to Drink: Bone Up Opening Day! Brewer's Notes: While there are some practical reasons why we chose this as our first beer, we care much more about the tasty reasons. We've loaded this with gobs and gobs of the finest hops that Four Star Farms (located in MA!) has to offer, and them hops are braced by solid, bready, slightly sweet backbone provided by Valley Malt (also from MA!). We like to buy local when we can (it only makes sense, as we're trying to encourage people to drink local), so we figured we'd show that off as much as possible* with the first beer that we'll be sharing with y'all! *Admittedly, much of the original concept for this beer stems from Jared's misunderstanding of a beer style acronym, but we'll let that slide.